FRESNO BEE: Large industrial water users take steps to cut water use as cities seek exemption from state drought rules. Small San Joaquin Valley cities that are home to large food processors are facing a drought-based dilemma – trying to balance state water mandates to cut consumption while keeping jobs that make their cities financially healthy. State officials are starting to realize that some water mandates have the potential to cause serious economic problems for smaller communities such as Lemoore, Sanger, Hanford and Livingston. The cities are at or near the top of the state’s priority watch list to reduce water consumption, according to state Water Resources Control Board documents. All are missing the state’s reduction mandate by 10 percent or more. Water consumption can’t be curbed by industry without possibly sacrificing thousands of jobs, so residents would have to conserve even more for their cities to meet the state’s mandated cuts. “Our cities, particularly the smaller cities with large industrial or commercial users, are in a very tough spot,” said Jason Rhine, a legislative representative for the League of California Cities. The state is requiring cities to lower monthly water usage this year in comparison with 2013 monthly totals. Each city has a different reduction goal and risks fines ranging from $500 to $10,000 a day for failing to meet the required cuts. Lemoore, Livingston, Hanford and Sanger are home to meat and cheese processors, large-scale water users and large employers. Livingston, home to Foster Farms’ headquarters, is the most significantly affected city in the state, which is why it received the state’s first alternative compliance order last week. The city’s water savings for June and July averaged 5.2 percent. The state’s mandate for Livingston is 32 percent, leaving it top of the state’s watch list for cities missing their mandated goal. It’s a serious issue for Lemoore. The city of 25,000 is on the state’s shortlist after it came up 10 percent short for June and July. The city has two large cheese-processing plants and two large plants that make tomato-related products. City documents show that industrial users consume 30 percent to 50 percent of the city’s water, depending on the month. Max Gomberg, a climate and conservation manager for the State Water Resources Control Board, acknowledged that there is basic water use in industry for health and safety thresholds that the state water mandate was never intended to affect. Lemoore is asking for a state reprieve. The city’s 32 percent mandated water consumption cut will be difficult to meet, said Joe Simonson, interim public works director. A state water official said Lemoore’s water mandate is being considered for revision. Livingston is the poster child for alternative compliance orders in California. The city’s water system serves a population of just under 15,000, but city residents couldn’t meet the state mandate and appeared to have no hope of achieving it. In 2013, Foster Farms used 58 percent of the city’s water. Last year, the company’s share was 67 percent and through July 2015, the portion escalated to 69 percent, state officials say. Foster Farms employs about 3,000 people in its Livingston plant and several hundred more in the company’s business offices. Its annual payroll exceeds $131 million, company officials say. The state’s goal for water conservation mandates was to reduce landscape watering and conserve wherever else possible, not create a public health emergency or significant economic impact, said Eric Oppenheimer, director of the Office of Research Planning and Performance for the State Water Resources Control Board. But water conservation efforts will not end when an alternative compliance order goes into effect on Sept. 18. Livingston must still undertake several programs to improve its conservation numbers. They include: adding staff to support water efficiency and code enforcement; hanging banners in strategic city locations to increase awareness of water conservation; modifying the city website to include more information about prohibited water use and limits on outdoor irrigation; distributing water conservation materials at downtown street fairs for the next six months; and exploring water conservation grant programs, such as those that offer incentives for turf and toilet replacement. Lemoore’s request for alternative compliance remains under review. If approved, the city would likely have to add the same programs. The state has requests from 13 other water agencies, including Corcoran and California Water Service in Visalia. Simonson said Lemoore’s residents are exceeding the state’s conservation goals. He estimates that residents have reduced their water consumption by about 41 percent in the first two months of the state’s rules. “The citizens of Lemoore are doing more than the state is requiring to allow their friends and neighbors to keep their industrial jobs,” he said. Gomberg said state water officials spoke to Corcoran city staff and told them they were close to their 36 percent target – they hit 34.5 percent. He said Corcoran’s numbers are close enough that the city shouldn’t need a revised mandate from the state. Hanford and Sanger, both among the top 10 on the state’s watch list, also need to make significant cuts. 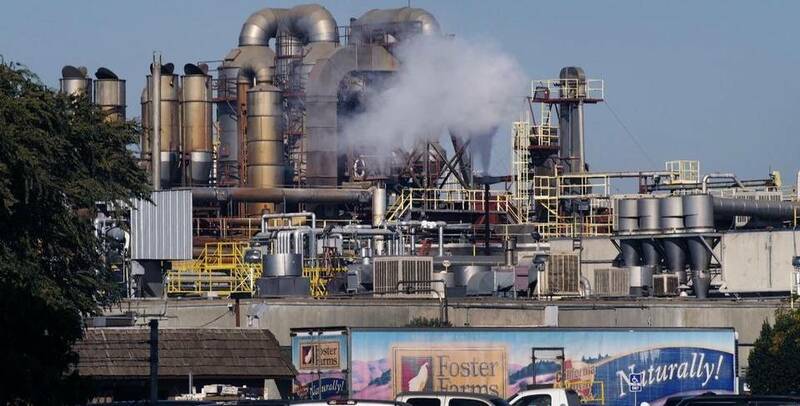 In Hanford, industrial and institutional commercial users accounted for about 12 percent of the city’s water use in July. When the weather is cooler, industrial use is a larger proportion. Hanford is averaging 11.7 percent, not even halfway to the state mandate of 28 percent. A compliance order was sent to Hanford. City officials say they have not yet sought an alternative order. The city has saved 31 percent on water used in parks and medians, but since 2013 it acquired the responsibility of providing water to a school and three subdivisions just beyond the city limits, said Lou Camara, Hanford’s public works director. In addition, a hospital and the county jail in Hanford also expanded, adding to the city’s water consumption, he said. Camara said the city must do more to improve residential conservation. In August, Camara said, the city issued 750 citations for a variety of violations. Fines were doubled earlier this year in preparation for the state’s mandates and now range from $50 to $200. The city is creating a new fee structure and a new billing system that will allow residents to understand the amount of water they use. In Lemoore, Leprino Foods has two cheese plants and 1,300 employees. The company uses less water today than in recent years. Erin Brozena, a spokeswoman for Leprino, said the company has stopped using water outdoors and reuses as much water as possible considering regulatory requirements and food safety standards. Raw milk used in Leprino products is 90 percent water, she said. The company makes cheese and whey products and supplements fresh water use with “condensation of whey” water, which is recovered at the end of cheesemaking and whey processing. Each gallon recovered through the condensation of whey saves a gallon of municipal water. The water is run through a reverse osmosis system, and most of it is used for cleaning around the plant or in boilers and coolers. Effluent from the plant is treated and used on crops that are sold to local dairy farmers, according to company documents. The company has changed some of its cleaning methods, “focusing on less water-intensive cleaning practices to reduce our demand for fresh water, such as dry cleaning methods and water conservation measures,” Brozena said. Sanger, which supplies water to about 25,700 residents, has a major poultry processor that uses about 8 percent of the city’s water – between 12 million and 18 million gallons per month, said John Mulligan, the city’s public works director. The city is averaging a 16.6 percent reduction in the face of a 28 percent state mandate. Pitman Family Farms employs several hundred, and water is one of its largest costs, said David Pitman, a member of the ownership family. Water is required to clean the buildings and poultry. Without it, the company couldn’t operate within state and federal guidelines. Still, the company has installed vacuum equipment to package poultry and remove vital organs and has saved about 40,000 gallons of water per day, Pitman said. About eight years ago, the company added an air-chilling process to chill poultry, saving 70,000 gallons each day. It’s in the company’s interest, he said, to save water, but government regulations are making it increasingly hard to do so. Read more coverage of the California drought and water issues in the Fresno Bee here. Marc Benjamin is a reporter for the Fresno Bee.